Diamond Engagement Rings – for a traditional approach, we offer hundreds of different styles of diamond engagement rings in white gold, rose gold, yellow gold and platinum. With prices ranging from as low as $300 to several thousand dollars, choose from different diamond cuts, designs like solitaire and three-stone, metals such as 10K, 14K and 18K gold and even platinum. Engagement Rings Under $500 – For those on a budget, our diamond engagement rings selection is available with specifications that will let you stay within the 500 dollar range. While $500 does not provide for as much in way of diamonds, we still offer breathtaking diamond settings in 14k and 10k gold, as well as smaller diamonds and optically flawless cubic zirconia, to allow you to stay within your budget without compromising the aesthetic value. Engagement Rings Under $100 – Sometimes diamond engagement rings are the best way to go, but other times cz engagement rings make more sense. Whether you are searching for a temporary solution while traveling or simply want to save, this section offers some of the most beautiful silver and gold plated engagement rings in the world. Choose from the same designs, such as solitaire, three stone, halo, side stone and others. 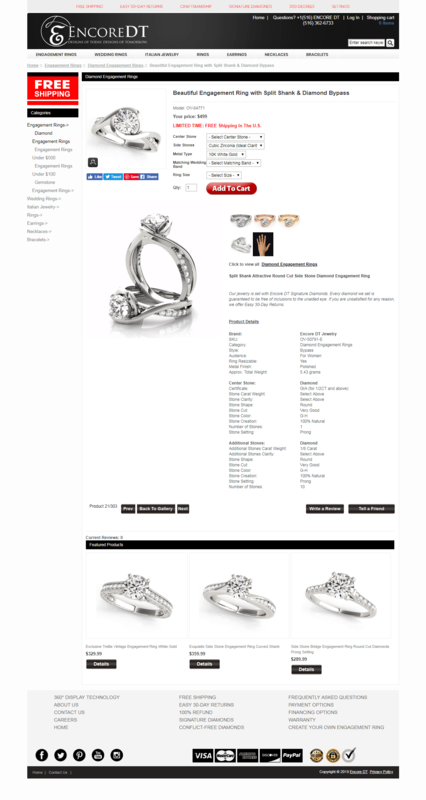 Wedding Rings Under $100 – This section offers tremendous bargains in both unique and classic, traditional cz wedding rings. Choose from eternity, semi-eternity, three stone and other non-diamond wedding rings, without compromising on design. All Other Jewelry – As a one-stop jewelry solution, we also offer Italian jewelry, rings, earrings, necklaces and even bracelets. Think of these as an extension of your engagement or simply as a means to surprise a friend or loved one on a special occasion. 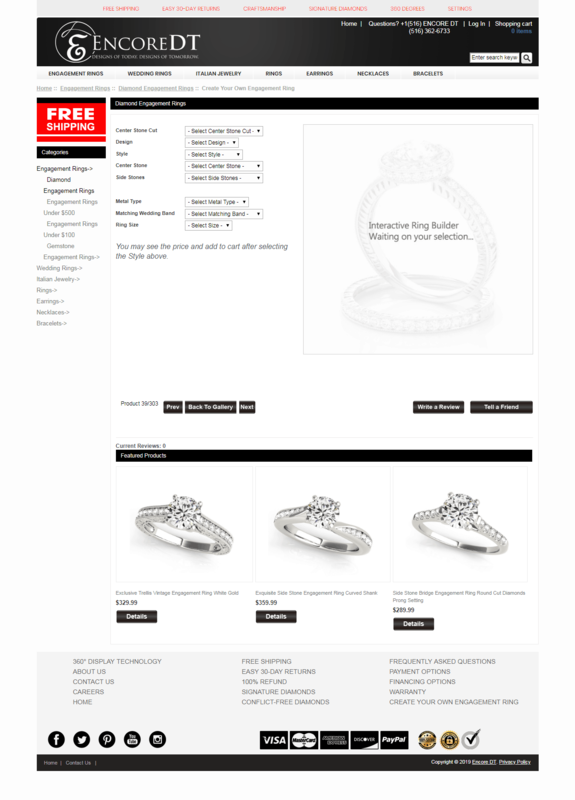 Problem: The client wanted a ring “Metal Type” drop-down field on the product page which would change the video preview of the selected ring. 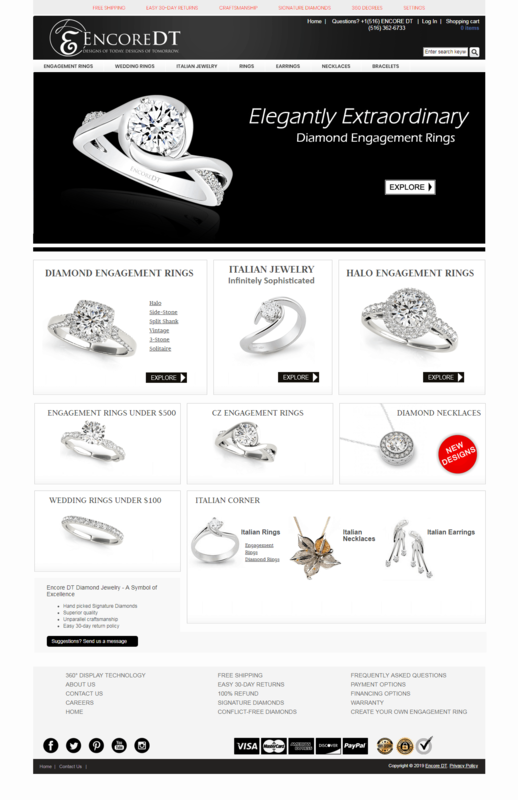 Solution: We developed the feature in PHP and jQuery and added it to the ring products on the website. Problem: The client wanted an application to allow customers to build a ring using multiple options before ordering. Solution: We created a product with the requested options that used a custom PHP and jQuery template.